SRINAGAR, Mar 13 2012 (IPS) - While the Jammu and Kashmir Cricket Association is hogging headlines over the alleged embezzlement of sports funds, Kashmiri youth are gearing up to write history in Kashmir’s cricket record. If all goes well, Kashmir will host its first ever floodlit day-night Twenty20 cricket tournament on Mar. 18, six decades after the first floodlit cricket match was played in England on Aug. 11, 1952 as a benefit game between Middlesex and Arsenal club at the famous Highbury stadium in North London. The initiative is not a government undertaking but was kick-started by two Kashmiri youth who own a small private web development company here. “I am not a cricket buff. But after watching day-night cricket matches in other states, I wanted the same in Kashmir,” said 25-year-old Amir Meraj Shah, who was moved to organise the tournament after consistently observing the pathetic state of cricket in Kashmir, despite the massive presence of cricket fanatics in the Valley. Most everyone from young children to their grandparents are avid cricket followers; posters of cricket players fondly find prominent wall space in shops, on buses and in numerous public places. 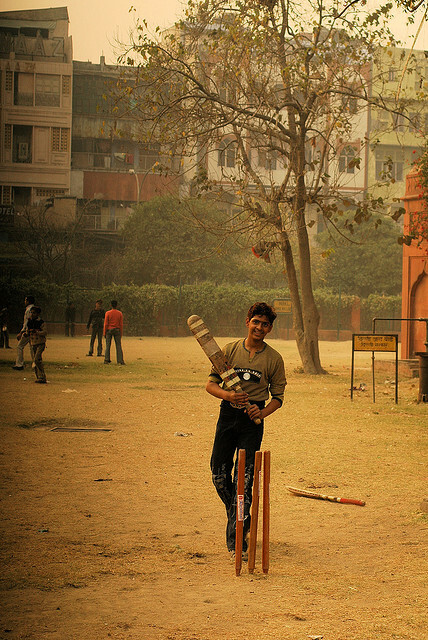 Street cricket is a widespread pastime, particularly during the frequent strikes or curfews. The tournament is scheduled to be played in a North Kashmir cricket stadium some 25 kilometers from the capital Srinagar, in the same place that hosted the state’s first Twenty20 premier league last year, and will include four matches of 20 overs each. The first three will take place during the day and the final match will be played at night. The tournament can accommodate 64 teams and already 25 teams from Jammu and Kashmir have registered. Together, Shah and his friends are ironing out all the details and managing all the expenses of the tournament with no support from the Cricket Association or any other government organisation. “We had asked the Cricket Association for dimensions of (flood)lighting but they denied knowing anything about it,” Shah told IPS. The organisers have secured permission from all the necessary authorities and security agencies for the tournament. “Our electrical engineers are already on the job of setting up lights. The diesel generators and poles have been acquired and mounting will start in a day or two,” Shah said. The venue can hold 210 spectators under roof seating. Meanwhile, two officials from the Jammu and Kashmir Cricket Association have been accused of siphoning off 300 million rupees worth of sports funds into ‘shadow’ accounts running parallel to the official bank accounts of the association, which has been headed for the last 30 years by Farooq Abdullah, former chief minister and father of the current chief minister. While saluting the young men’s initiative in driving the day-night Twenty20, officials from the Jammu and Kashmir Sports Council claim the organisers are not entitled to any government funds. “The Cricket Association or other state sports agencies (can only fund) those organisers who are registered with (the government),” said Mushtaq Ahmad, a representative of the Sports Council. The prospect of the event has thrilled the people of Kashmir who are eagerly anticipating Mar. 18. “It is a wonderful initiative. We have never seen a cricket tournament in Kashmir. I will surely be a part of it,” said Mukeen Khan, a 12th grade student. “The scam of the Cricket Association has clearly exposed their work. Now it is the youth who can change things,” he added. Ruheela Habib, a cricket buff and post graduate student of political science, believes that the tournament will create history. She says that the people of Kashmir should support such ideas by all means. Only two international cricket matches have so far been played in Kashmir. The first was between India and Clive Lloyd’s legendary West Indies in the autumn of 1983. In 1986, India and Australia played a match at Srinagar’s Sher-e-Kashmir cricket stadium. Day-night matches have never before been played in the conflict-ridden valley. Sports activities took a major hit after the insurgency began in 1989, with no major sports event held or organised here in well over two decades. Indeed, the Jammu and Kashmir Sports Council has been almost redundant for years. Absence of infrastructure, lack of required coaches and training for youth has marred sporting activities in the region.